I have been having good luck with the Winning Cooperation Tool Card this week. 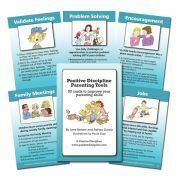 It is interesting how many of the tool cards emphasize listening. I would venture to say that 80% of good parenting is learning how to listen to our children. Gibson: I don't know what to do about math. Gibson: Yeah...I've never had an incomplete in math before. Dad: What is an incomplete? Gibson: If you don't pass a quiz, you get an incomplete. Gibson: Yeah...if you get more than two answers wrong on the quiz you get an incomplete. Dad: Wow! That sounds hard. Gibson: Yeah...I guess I'll go talk to my math teacher tomorrow and ask him for help. Dad: That sounds like a good idea. Dad: Do you want to play ping-pong before you go to bed? Now I'm not sure if "Oh" is the best response when talking to your kids. That's just usually what happens when my son starts talking about math. I get a deer in the headlights look on my face and say "Oh". In fact, my next blog post will be about math and how frustrating that subject can be for parents. But I digress...the point is that I took the time to listen to Gibson and allowed him to process his thoughts and feelings out loud. Gibson is a straight A student, so having an incomplete was a big deal for him. Instead of trying to fix the problem, I just listened and he was able to come up with his own solution. There are so many things going on around our house that require us using this tool card - it seems overwhelming! I'd love to hear how others are doing with this card this week. It's so encouraging to hear the positive outcomes and for the not so positive, I realize that I'm not alone!